In Ep. 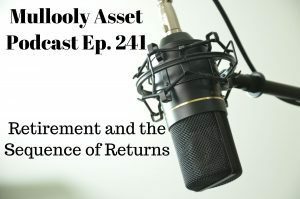 241 of the Mullooly Asset Podcast, Brendan and Tom talk about the sequence of returns in the market and how they can positively, or negatively, affect your retirement. They tie in some baseball history and talk MLB free agency as well! Enjoy! DISCLAIMER: Tom Mullooly is an investment adviser representative with Mullooly Asset Management. All opinions expressed by Tom and his podcast guests are solely their own opinions and do not necessarily reflect the opinions of Mullooly Asset Management. This podcast is for informational purposes only and should not be relied upon as a basis for investment decisions. Clients of Mullooly Asset Management may maintain positions and securities discussed in this podcast. Tom Mullooly: Welcome to the Mullooly Asset Management podcast. This is episode number 241. Brendan: 241 and I think we’re going to actually talk a little baseball to start. Tom Mullooly: Nothing better to talk about in January than … being a Met fan January is the best time of the year. Brendan: Yeah unfortunately. But always looking to tie in different areas that that we can relate to a financial topic that we want to discuss and I am delighted to talk some baseball first because that is my favorite sport to watch. Tom Mullooly: So before we turned the microphone on we were talking about AJ Pollock had just signed with the Dodgers and we talked about … I told Brendan that I have a secret wish that the Mets are going to sign … they’re not signing anyone now, not making trades for the last few weeks because they’re gearing up to make a big announcement for Bryce Harper or Manny Machado. And you mentioned something that both of us read about the Vegas odds right now, a number of wins. Brendan: Or Machado or Dallas Keuchel who they’re talking about, some of these big names. Tom Mullooly: So the first natural thought is wow that’s really going to help the Phillies but it also hurts everyone else in their division because the Mets for example play the Phillies 18 times a year. Brendan: Right. So about 10 percent of their schedule during the season are head to head games. So baseball being a win or lose sport, no ties, this is a zero sum proposition. So if the Phillies are getting some wins it stands a decent chance that maybe the Mets in those projections drop a game while the Phillies pick up a couple saying that they’re going to they’re going to win a few more games and maybe at the expense of the Mets. Tom Mullooly: I shared a story with Brendan again as we were coming in here to record this how just thinking about that a little further I read a story, the 69 Mets, it was kind of a fluke of the schedule the way things worked out. The Mets played most of their games in the Eastern Division in 1969. They played most of the Eastern Division early in the season; April, May and June when the weather wasn’t so great. The Cubs were out on the West Coast. They were playing West Coast teams. When the schedule flipped to the second half the Mets at one point at the end of July were nine and a half games in second behind the Cubs. And the Cubs totally folded down the stretch and the Mets just raced ahead. And I think the actual positions flipped. The Mets won by nine or 10 games that year but part of the reason was in July, late July, August, the Mets were playing on the West Coast and they were playing at night. So they were playing in San Francisco, Los Angeles, San Diego and they kicked the snot out of all those West Coast teams that year, that really helped them. The Cubs did the same thing but they played them earlier. The Cubs now in the second half of the season played all of their games or most of their games at Wrigley in the afternoon. Can you imagine playing every afternoon in August in Chicago in a day game? Everybody just folded on that team. So part of it is the schedule. Brendan: Yeah. So point being strength of schedule or the way that it was laid out for these teams, the order in which they played opponents and where those games happened had an impact on the way things finished up. And this is how we make our segway into finance because it had us thinking about something a lot of people in our industry will refer to as the sequence of returns. Tom Mullooly: So what happens when you’re planning for retirement the year you retire or the year after you retire we run into a bad market or two years of bad markets, a market goes back to back down double digits two years in a row like 2001 and 2002. Brendan: Right that’s exactly. That is sequence of return risk. So you need to plan for things like that when you’re mapping out of retirement and one of the ways to do that, a lot of people in our industry will use something called a Monte Carlo simulation. Basically what that is going to do is let’s say we have recommended a portfolio that we think is going to throw off something like 5 to 6 percent annual returns over a 30 year retirement. How we get to those 5-6 percent returns could be very very different depending on the way reality unfolds. Because what is not going to happen is we are not going to collect 5 percent a year in perpetuity. You withdraw 3 or 4 percent a year and just skim the interest off and live like the ending of Shawshank Redemption for the rest of your days. That is not what is going to occur. Tom Mullooly: There used to be a stat were circulated 20 years ago that the market had returned from the 1929 through 1985 the market had returned something like 10 percent a year. But how many years did the market actually return exactly 10 percent that year? I don’t think there was a single year right where that happened. And so we have to get used to the idea that some years we’re going to lose some money and some years we’re going to make more than we should. It’s all going to work out. There’s the trust factor that comes into this. But I want to circle back to a phrase that we brought up a minute ago called Monte Carlo. One of the unwritten rules when you’re sitting down with a client or potential client is not use the words Monte Carlo. Brendan: Probably for the best. Tom Mullooly: Because what’s the picture that they have in their head when they hear Monte Carlo. Holy crap, we’re gambling. Brendan: Right exactly. It sends a bad message. Yeah, agree. Tom Mullooly: But correct me if I’m wrong but we had someone in here in the conference room, this was a couple of years ago, a client was about the right age and I brought up the scene from the movie Wargames. So indulge me for a moment. If you’ve ever seen the movie Wargames, Matthew Broderick, came out in 1983-84, something like that. Towards the end of the game they actually got the Whopper, the computer, to play tic tac toe and it started out very slowly with an X and an O and some ding dong said put the X in the center but it would just play game after game after game slowly slowly picking up steam and it would go faster and faster and faster until 10 seconds later it is now playing game after game after game lightning fast and it’s just automatically replaying the game over and over and over and over and over, doing all these simulations and then it finally comes to the conclusion that you can’t win the game. That’s kind of like a Monte Carlo simulation in the sense that it runs all of these potential returns over and over and over, gets to a percentage that we think with 90 percent confidence that this portfolio is going to return x percent a year. Brendan: Well right. And it’s looking at if we say we’re going to put together a portfolio that averages 5 percent a year let’s say it’s going to run 1000 simulations of trajectories that that portfolio could take to average 5 percent a year over a 30 year period. Those are going to be vastly different. This is a projection, point being that if we’re projecting something we are getting 1000 versions of how this could occur. Reality is we’re only going to live one of those scenarios. And so this is why this isn’t like a set it and forget it proposition where at the beginning of retirement you’ve run the Monte Carlo, it tells you yeah you’re probably going to be fine and you leave it alone. Tom Mullooly: A different Monte Carlo would be like let’s run a projected 5 percent return on our portfolio per year and let’s compare that to a Monte Carlo simulation with 8 percent a year. What are the odds of that happening? Brendan: Well you could look at it that way or you could look at it as here was the Monte Carlo that we ran at the onset of this investment plan that we’re putting into place to support your retirement. Now that we’ve lived through two-three years of it and gotten the returns that existed over those two to three years now you have this amount of money and this amount of years remaining. What about now? What are the odds now? Are they better or are they worse? They’re probably not going to be exactly the same as they were a couple of years before that. And so this is a thing where you want to be monitoring this over time. And I think this is probably one of the tools you use to drive decisions in terms of what are we doing with the portfolio, does that still make sense given our probabilities now. How about withdrawals, should we continue at the rate that we have been. Have we been shooting for a fixed dollar amount each year like $50,000 a year being thrown off this portfolio or was it a percentage of whatever the value is, did we want 3.5-4 percent of the portfolio regardless of maybe taking into account market fluctuations a little bit more. How can we alter these different variables to improve the probability if it has changed to such a degree that it is not something you’re comfortable with anymore. Because like I said you’re only getting one version of these 1000 simulations. Tom Mullooly: So to your point you get a couple of years into retirement and the numbers change. You may have taken some distributions. The market may have changed the value of your portfolio. Well it definitely has. Plus your withdrawals. And you run these Monte Carlo simulations I don’t want to say all the time but you should run them frequently because you want to see what kind of changes should we make. So the idea of being Warren Buffett and we’re going to just hold on to this portfolio forever probably doesn’t make a lot of sense because situations change, not that we want to be talking about market timing but it has to be constantly monitored. Brendan: Yeah I think that there are certainly people out there that use the sequence of returns to drive a discussion about how they are going to sidestep all of the damage and time the market so you don’t have to worry about sequence of return risk to which I say baloney. They are not going to do that and run away from them if that’s how they’re using this. This discussion is more about if you’re checking back in on a Monte Carlo that you ran it’s about seeing how reality has impacted the projected plan that you put together and how it should affect your decisions moving forward and whether that means an adjustment to the portfolio or an adjustment to your lifestyle or taking into account that something in your life has changed. Maybe in the interim you have picked up like a part time job like a hobby that you enjoy and you no longer need 50,000 a year from your portfolio, you need 38 now because you’re making up the difference doing something you enjoy every day. Or at least for the next couple of years you’re going to lower the distributions from the account or you’re going to raise them because you were doing something and that has changed. How is that going to impact the probability of success. But you can use this to look at different scenarios and how they would impact what you would like to do or the different options that you have in front of you so that you’re making informed decisions. Doesn’t always mean you’re going to take the one that has the highest probability of success but you should at least be taking that into account so that you know if you’re leaving a more optimal solution on the table that you’re doing it for a good reason that makes sense to you. Tom Mullooly: I think the other thing when we can talk with a client and say probability of returning 5 percent or 6 percent a year we have ,returning the distributions you’re looking for from your portfolio we have a high degree of confidence that we can do it. It isn’t 100 percent. Brendan: No nothing is and it shouldn’t be taken that way. And that’s why you have to work with projections if you’re going to do any planning at all. So I understand that predicting and projecting are often time things that get blown up because of reality. But I don’t think that means you shouldn’t do it because flying blind is probably a worse proposition than what we are suggesting using this tool for. What it can also do is to show look at this rate that we’re headed things are not going to work. It can give the bad news that needs to be brought to the table rather than being the ostrich with their head in the sand. If you’re making a decision continually that is going to lead to everybody’s unwanted outcome of running out of money before they reach the end I think you want to be aware of that before the fact and not when it’s too late. You can become aware of that as this is unfolding so that maybe you can make some adjustments so that is no longer the case. Easier said than done but at least you had the opportunity to rather than realizing one year like wow this is not going to work and I’m not planning on kicking it anytime soon so what’s going to happen. Tom Mullooly: Right. That’s a real problem. I mean that’s probably the biggest worry that a lot of people have. That’s what people come to us for. You don’t want to be running out of money at 74. Honestly you should be running out of money at 94. Brendan: Right. Right. And again you’re looking at this every year so if things change and you’re in poor health and you want to accelerate how you’re withdrawing your accounts because you don’t think you’re going to see 94, if that is the proposition that is in front of you, OK so what is this going to do to the plan and are we going to be OK still can, can we do this, what do you think. Tom Mullooly: It’s funny, we’re working on a plan right now where someone is meeting their obligations but barely. And the conversation that I had with the client was you’re going to be OK as long as there’s no surprises. And surprises at this age they’re usually not good and they’re usually very expensive. And so that I think is one of the things that throws a lot of these projections and plans off their course is that something comes up where they have an unforeseen expense of 25 or $50,000 and this just totally rips apart the plan. Brendan: Well I think that when that is the case, if somebody can meet their obligations but there is no wiggle room in their plan the probability of success is not going to be very high because you want to bake in surprises and if you are not baking in surprises I think that you’re making a mistake. And so the solution there is that as things exist now it looks sustainable but it looks fragile and we’re not comfortable with that. So what can we do to make this work better. And the solution isn’t going to be we’ll lower your life expectancy to 86 instead of 94. Tom Mullooly: Oh my God, no. Brendan: No so the difference is going to be can the portfolio be set up differently to make this work better. In a lot of cases I don’t think that that is going to have a huge impact in terms of what happens. So I think it becomes a conversation about the lifestyle and what can realistically be expected to be thrown off of this portfolio. Maybe this rate can be continued for the next year or two or three but some big changes need to be made so that down the road this can continue and we can feel comfortable knowing that we are going to be surprised in one of these years and that it is not going to have catastrophic ramifications for their finances. That’s how you use this to map out somebody’s retirement. If you’re not baking in wiggle room then it’s not reality. Tom Mullooly: You’re doing a disservice. You really are. Well good stuff. Brendan: Yeah. All from the Mets huh. Tom Mullooly: Hard to believe. So I what I think I’m probably the leader of the Jerry Koosman Fan Club so I’ll remind everybody in August and September of 1969 Jerry Koosman went 9 and 1 with like a zero ERA. Brendan: Not in the Hall of Fame. Tom Mullooly: Not in the Hall of Fame. 2600 strikeouts. Brendan: Veterans Committee let’s take care of that. Tom Mullooly: I think it might even be too late for that. I don’t know. Tom Mullooly: They got Harold Baines in. So we’ll see. Anyway thanks for listening to episode 241. We will catch up with you next time. Credit Card Applications, 529 Plans, Penny Stocks, & More!